Today like in the past we are continually in search of a place that offers peace and quiet; a place where we can live in harmony with nature as well as art; a "locus amoenus", where we can dwell and appreciate art. This is what you will find at IL MATTONE, a country inn located in the heart of Tuscany, between the spectacular hills of Florence and Siena. 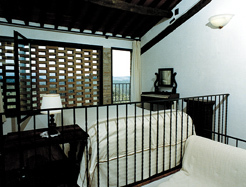 IL MATTONE is nestled countryside, overlooking the charming medieval town of San Gimignano. It offers a stunning view of this town which seems to be frozen in time. 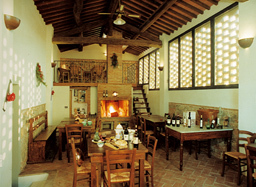 Easily accessible are Siena, Florence, Volterra, Colle Val d'Elsa and the region of Chianti. 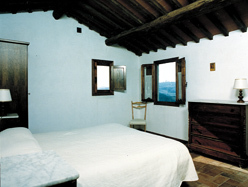 You will find that this property is rich of history and landscape. All guestrooms have been renovated using the finest materials, without compromising the architectural integrity. Attention to detail is evident in all the rooms. In addition to the enchanting panoramic view, each room features a queen-size bed, some with an additional single bed, and private bathroom. A kitchnette providing self-serve food products for breakfast is available. Guests are free to enjoy the spectacular garden, pool, tennis court, as well as an anphiteathre in classic style. Ample parking is available. Enjoy a peaceful walk within the complex and surrounding areas. Your soul will be nurtured by the pitttoresque landscape. The complex features D.O.C.G. 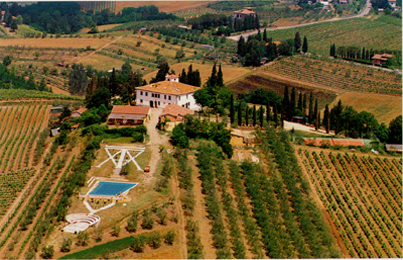 Chianti and Vernaccia di San Gimignano vineyards, olive groves which produce the purest extra virgin olive oil, fields of crops, wooded areas and a small pond. The land is cultivated ecologically and in compliance with E.E.C. regulation 2078.92. As you make your way towards the outskirts, you will notice deep tangible traces of an ancient civilization. The medieval Francigena Way for example, is a cluster of roads, which in times gone by, marked the final stop that would lead the way to Rome and the Holy Land. Visit IL MATTONE and experience a perfect fusion of ambience, history and relaxation, explore the grandeur and beauty of this ancient land. Embark on a journey of well being as it happened in ancient times, when man would leave the hustle and bustle and find himself in another time dimension. From Siena-Florence 4-lane freeway, exit at Poggibonsi Nord. Follow the signs to San Gimignano. After 2-3 kilometers, at the road-fork, follow the Ulignano sign to the right. After 6-7 km., you will reach Ulignano. Turn left to San Gimignano. Continue about 2 km., IL MATTONE is on the left. 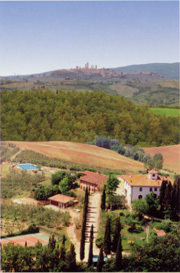 If you miss the road-fork to Ulignano continue until you reach San Gimignano. 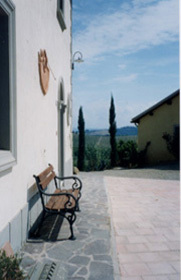 From San Gimignano, continue along the wall until you see the road-fork on the right to Ulignano. Take the road, continue about 5 km. IL MATTONE is on the right.